Objective: This study radiographically evaluated the tibiotarsal joints of patients receiving ipsilateral triple arthrodesis and analyzed the effects of this procedure over the short and medium terms. Methods: A total of 150 triple arthrodesis procedures were performed between 2010 and 2015, and 56 patients (62 operated feet) participated in this study. The ankles were radiographically evaluated at the following time points: the initial or preoperative period, 1 year after the operation, and 3 to 5 years after the operation. The presence of arthrosis according to the Kellgren and Lawrence (K&L) scale and the onset time of secondary arthrosis worsening were observed. Results: During the initial period, 31 ankles (50%) presented with no clear signs of arthrosis. Tibiotarsal arthrosis presented with a worsening of 1 degree in 13 ankles 1 year after surgery (28.3%). 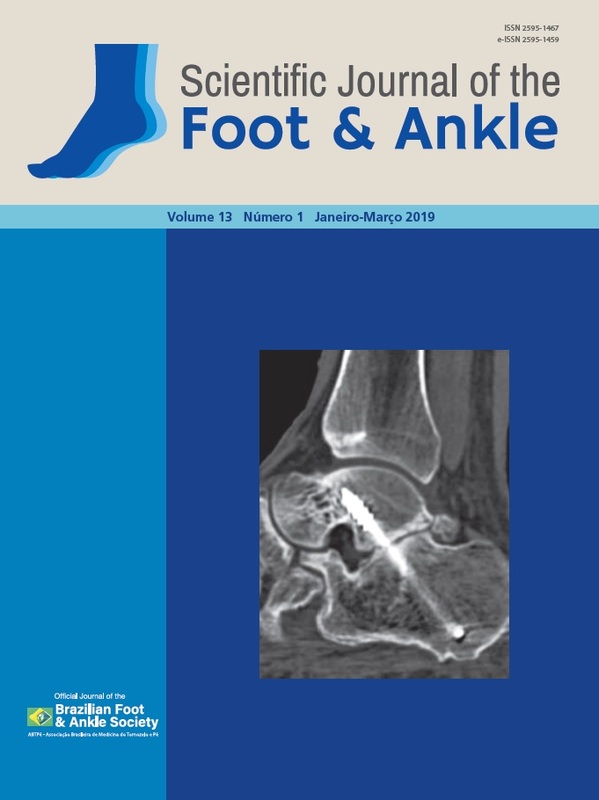 Three to 5 years after surgery, a 1-degree worsening of 21 ankles (55.2%) was observed; 15.8% (n=6) of the ankles had a worsening of arthrosis greater than or equal to 2 degrees; and 11 ankles (29%) had no worsening or onset of tibiotarsal arthrosis. The worsening or onset of tibiotarsal arthrosis occurred an average of 22 months after the procedure. The mean postoperative evolution time was 32.4 months for those who presented with an arthrosis worsening of only 1 degree. Those who presented with a worsening of tibiotarsal arthrosis of 2 or more degrees had an average postoperative evolution time of 43.7 months. Conclusion: Radiographic findings strengthen the concept of arthrosis formation following triple arthrodesis in the tibiotarsal joint, even over the short and medium terms. Level of Evidence IV; Therapeutic Studies; Case Series.